Have you ever felt at home when you were really eight thousand miles away from home? This was my experience of the Holy Cross family in Jinja, Uganda. 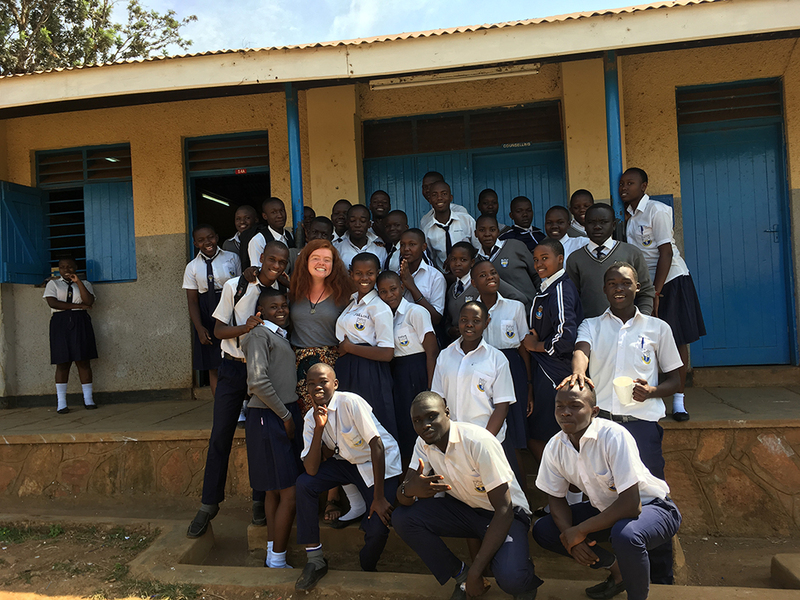 Through Notre Dame’s International Summer Service Learning Program (ISSLP) last summer, I spent two months living at the undergraduate seminary for Holy Cross East Africa and teaching at one of the district’s first mission schools: Lake View Senior Secondary School. I worked as an English language teacher for the equivalent of eighth, tenth, and thirteenth graders, and I also assisted with basic computer classes and co-curricular activities. 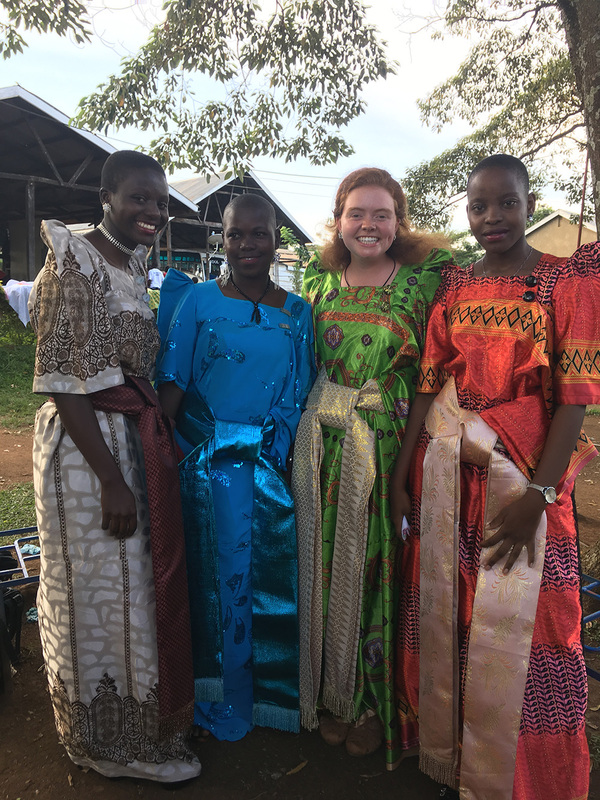 Recently I returned to Jinja for ministry research over fall break to investigate what makes Holy Cross so special as they bring Catholic social tradition to life through their mission. From the Holy Cross mission at Lake View, I learned that beyond being “just” an educator, teachers are called to care for the whole person. Every day I find myself unpacking more of my international experience with Holy Cross, and I cannot say enough about the Missions as it brings a familial charity in schools and pastoral care across all borders. 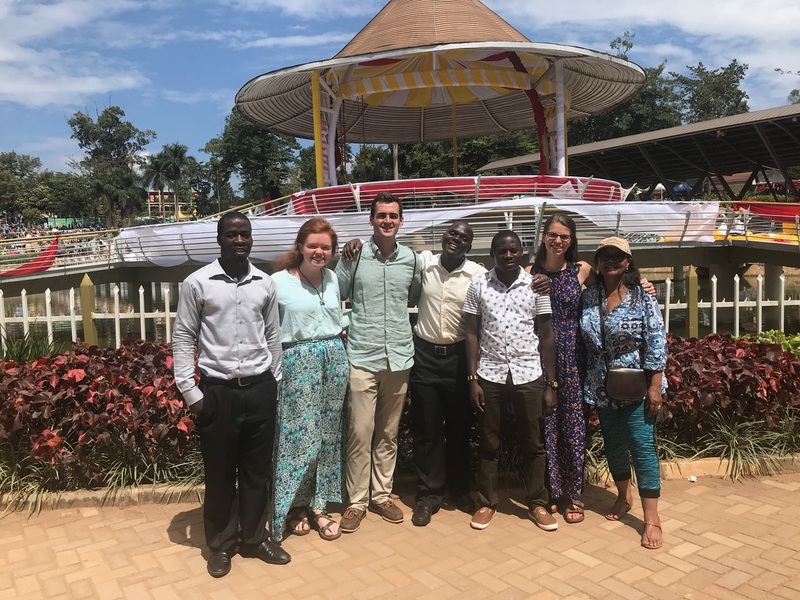 ISSLP students traveled to the Shrine of Namugongo with members of the Holy Cross family on pilgrimage for Ugandan Martyrs' Day 2018. What happened to me “along the way” in Jinja was my discovery of the special spirit of Holy Cross which seems most fully alive in mission, extending family across borders in every sense of the word. To be factually correct, I must say that the charism of the Congregation of Holy Cross is “to educate in the faith.” However, I found that uniting with others as family on mission is a guiding pillar for the order which makes this education possible. Thus, family has become for me an unofficial charism, the purpose, and the personality of the Congregation of Holy Cross, and this is rooted in their consecration to the Holy Family of Jesus, Mary, and Joseph. It was in Jinja where I learned that Holy Cross is more than the collegial spirit of “the Notre Dame family.” This prompted some personal reflection on a Mother Teresa quote which I have always found provoking: “The problem with the world is that we draw the circle of our family too small.” All of us, as a part of the Holy Cross network and the larger Catholic Church, are taken up into this project to widen our circle of family. Grounded in the Constitutions of Holy Cross, the Holy Cross family on mission leads one to solidarity across biological conceptions of race, tribe, and family. Wherever you are in the world, a Christ-centered community is the grounds for real solidarity and accompaniment, and the CSC religious have no family but their own order, the local schools, and greater Church to love and share life with. The Holy Cross sisters, brothers, and priests work together with a particularly unique familial spirit in the District of East Africa. Their unofficial “charism of family” creates solidarity, and that charism demonstrates the power of service which is magnified in the context of an outward-facing religious community which is dedicated to their apostolate. In East Africa, Holy Cross parishes and hundreds of rural outstations serve families with Catholic sacramental life and pastoral care across the district. Holy Cross Family Ministries offers critical marriage counseling, family support, and children’s formation programs inspired by Venerable Fr. Patrick Peyton’s motto, “the family that prays together, stays together.” The Congregation is especially focused on the emotional and spiritual care of the local Christians, but they do not neglect their material needs which can be extremely grave. I was initially disheartened by my research which demonstrated the crisis of poverty for Ugandan families, but Holy Cross is earnestly striving to bring hope with holistic support. To this point of financial sufficiency, Bugembe Parish outside of Jinja has begun a micro-finance community-lending organization. Different district projects are starting income-generating activities, producing crops and crafts, and learning vocational skills. Me with members of my S4 English class. Holy Cross Lake View Secondary School is an expansion of Christian community in a family-like environment. Blessed Basil Moreau, the founder of the Congregation of Holy Cross, writes that “from the moment teachers accept charge of young people for their education, they become guardians,” and I witnessed this spiritual guardianship most strongly in Holy Cross East Africa. Secondary schools in Uganda serve boarding students who share all parts of community life within the compound for ten months of the year. 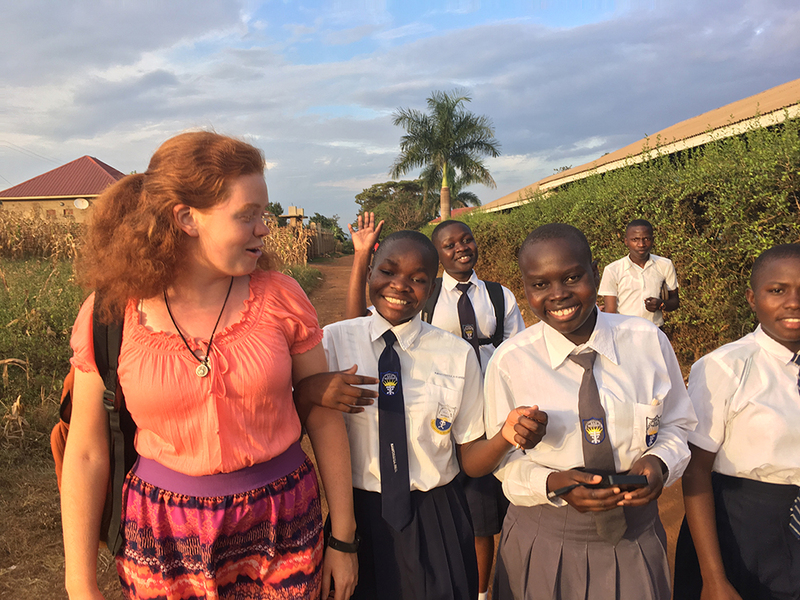 I know that some Ugandan schools fall short of providing an atmosphere of love and support for their students, and so Holy Cross schools seriously make a difference in this context. More than 800 students live in Lake View’s dormitories, and teachers step into the role of parent and guardian as the students are far removed from their families. There is a tangible sense of love present at school, a sense that these young people matter and they are worth our time. Moral and spiritual development is a beautiful focus of the order’s holistic education in a setting which feels like family. Engaging in "flexible jazz" with some students on a walk to the football pitch. Lake View teachers develop a sanctifying, energizing spirit of family beyond the classroom through co-curricular responsibilities, presence in the dormitory, organizing athletics, and informal counseling and emotional support throughout these avenues and free time. Contributing to the familial atmosphere of the school is not considered “above and beyond,” but rather a real expectation for Holy Cross. This comes at no little sacrifice as teacher responsibilities require many hours of work without extra compensation. The time-intensive Ugandan marking system combines with large class sizes of fifty or one hundred students to create a backlog of grading for teachers who trade off so much time at home, but the community spirit of the school strengthens everyone to carry on. The teachers’ charity seriously inspired me, as did the students. Lake View’s motto is “Education for Service,” indicating the kind of chain reaction by which education inspires further service by those who are served. From various humble backgrounds, Lake View students know the value of their education, and they are the most dedicated and respectful students I have ever known. Compared to the average American adolescent they were absolutely inspirational in their work ethic, their humility, and their devotion. Can you imagine eight hundred young teenagers participating in Mass with full heart and voice? Some of the boys would really sing themselves hoarse, and that was the vibrant worship we shared together daily with morning praise or Mass. The students are rooted in prayer, reciting the Rosary every day during the month of October. During the same month, one student founded a devotional group for the Seven Sorrows of Mary which meets during lunch with intentions for family and loved ones during an additional seven decades of Hail Mary’s – these kids really love Mary! Beyond private piety, Lake View students are highly empathetic and thoughtful about the most marginalized, even when they themselves have little extra to give. For example, the Brother Andre Vocations Club offered prayers and organized a money collection to house a homeless man who they discovered living in the swamps of Lake Victoria. Some students fasted from their morning snack allowance for one week to save a few shillings – these are children as young as twelve or thirteen who told me, “how could we not do whatever we could?” From various humble backgrounds, many students would couch their career dreams in the context of service for others. In some of the students’ own words, they say, “I want to take care of orphans because there are so many lonely here,” “there are sick people who need our service,” or “I want to help those who can’t help themselves.” One student even told me she wanted to come to the US as a future doctor to serve in return, offering medical assistance to the American homeless population because she knows “there are poor people everywhere.” Holistic education of the body, mind, heart, and spirit is really taking root in the students’ hearts at Lake View Secondary School, and that is all thanks to the warm family of the Congregation of Holy Cross. Students present a traditional Musoga dress called a gomesi for the school's Cultural Day. After much convincing, I agreed to participate! There are an endless number of stories of hope with Holy Cross, and I pray I may encounter more in my future. What has happened to me “along the way” thus far? Ultimately, just witnessing the missions is a real formation in Christian solidarity. It’s an even greater gift to have participated in that mission as it’s stretched my sense of family for the larger family of God. The missions are contributing to even secular notions of authentic development with their emphasis on holistic education, and their unofficial “charism of family” truly widens the sense of solidarity for our universal Church. The community in Uganda is different than my own in the United States, but through Holy Cross, there was so much more which I found in common. Everyone from students to lay collaborators benefit from that Holy Cross hospitality and extended charity as spiritually adopted members of the same community across borders. I feel like I glimpsed a part of our heavenly family through my experience with the Holy Cross missions, and it makes me long for the unimaginable unity of the heaven we were made for. As my Ugandan friends taught me, some gifts can only be received with thanksgiving. And for all I have experienced with Holy Cross, I find myself returning to the Source of every good thing. Webale Yezu! Webale inho. Thank you, Jesus. Thank you so much. Maureen Schweninger is a senior at the University of Notre Dame, studying theology and sociology with a minor in Catholic social tradition. Traveling to Uganda was her first trip overseas. 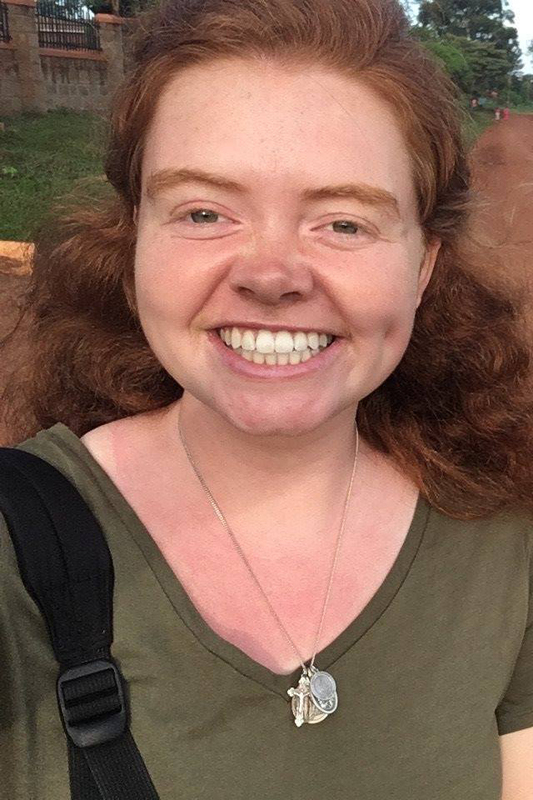 After graduation, Maureen is delighted to be returning to Jinja for independent post-graduate service in collaboration with the Congregation of Holy Cross. Contact Maureen via email at .